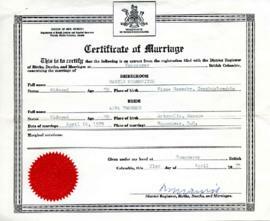 Series consists of marriage and divorce records. Newspaper clipping announcing the marriage of Judy Morris and Irving Zaitzow. Also contains a photograph of the newly married couple. On page 3 of Vol 3. No. 41 of the Jewish Western Bulletin, published on January 19, 1933 under the Special and Club News section there is an excerpt announcing Ralph and Ann's engagement. 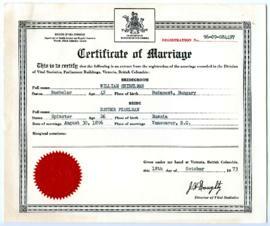 Marriage licence fee receipt for Harry Seidelman, dated November 15, 1938.